A lecture given by Imai Soke on his first trip to Canada. Musashi said, As long as we have our lives and we are on this earth we have to try and create for ourselves a wonderful peaceful life. in order to that we must have peace of mind and a strong sense of morality. But considering the history of morality we also need great strength. 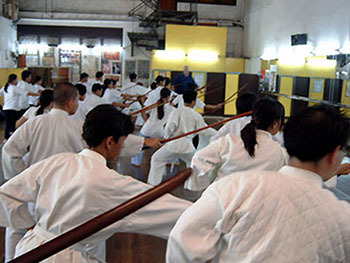 We therefore train in a martial way for the security and peace of our countries. The maxim of practice is based on: The sword is the heart. If the heart is not correct our sword is not right either. If one wishes to learn the sword one must study the matters of our heart first. This is the way of dealing with swordsmanship. 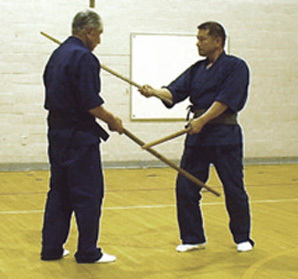 Wrongly people who are considered to be experts in Kendo say that Kendo is a way of building up human characteristics by practiceing the natural laws of the sword. Musashi's thoughts were, "Since we are born and live on this earth we should face God, give birth to children, increase the human race and make those around us happy. In order to do this we have to face the unavoidable and our fatality, our meaning of life. We use the term Shukumei wo motteiru. meaning 'To understand what we are born with'. The strength to face fatality is called Bu by Musashi. Bu means an honest feeling and an honest heart. This honesty is based on thoughts of God. Musashi also used the word Chokudo. This means "To take straight path". Lots of people try to persuade you will lessons of what you should do in life. Musashi said, "If you just listen and dont take action it means nothing".Buddha preached his Buddhism but did this make India happy? Look at the country now. The same can be said of Jesus Christ. What are the Jews doing now? Musashi put his strength into the meaning of life which is greater than his fatality and he called it his Bu. His name starting with Mu has the same meaning. "An honest feeling, an honest heart". Musashi's waza is "empty" without Musashi's Mu. Yagyu had made comparisons of power saying one should consider the strength of ones enemy like a great boulder rolling down a mountain towards you. With Musashi's thoughts towards this he considered the power of a drop of falling water.